Pond Island, near the mouth of the Kennebec River, just offshore from Popham Beach. Can be viewed from the beach or from various boat tours. As with most cases with the early lighthouses, construction was awarded to the lowest bidder, who usually cut costs. Pond Island Lighthouse was no exception and the original beacon lasted only until 1835. Water was also lacking, as many times keepers needed to get water from the mainland during frequent dry weather. A cistern was finally built after many pleas from keepers. In November 1849, the vessel Hanover, was caught in a fierce storm near Pond Island lighthouse. As the captain was trying to get around Pond Island to a safer spot inland along the Kennebec River, the ship ran into a bar off nearby Wood Island and soon sank with all 24 crewmen on board. Only a dog survived. Isaac Morrison became keeper in 1889, and was a well-known fiddle player. As word got around about the keeper’s talents, a young resident who leaved nearby, Hiram Stevens, would row out to the lighthouse for weekly lessons from the obliging keeper. Stevens later became a successful composer and had several pieces performed by John Philip Souza's band. Morrison was keeper until 1903, when he suffered a stroke and had to be retired. Today, the island is now managed as a wildlife bird refuge for roseate terns, common terns, and eiders by the U.S. Fish and Wildlife Service. 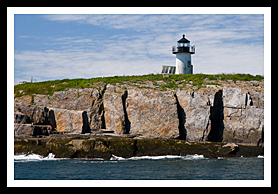 Although best viewed by boat, visitors can view the lighthouse from Popham Beach at the end of Route 209. If you happen to arrive there at low tide you may be able to walk over to nearby Fox Island, climb up the rock hill and get an even closer view of the lighthouse. Close views can be obtained of the lighthouse from Popham Beach State Park during low tide. 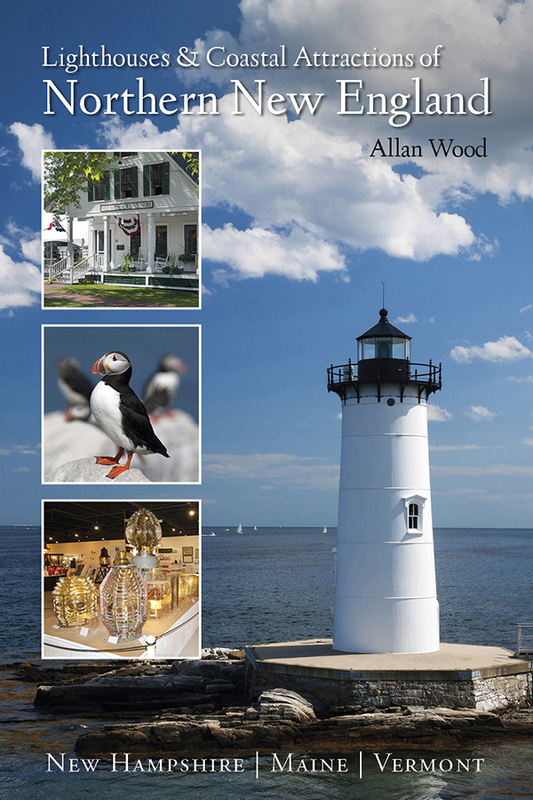 From the beach at the village of Popham you'll find the best views of Pond Island Light. If you happen to arrive at the village during low tide you can walk out about 3/4 of a mile from the beach towards a private island where you can get some closer photos of Pond Island Lighthouse and another view of Sequin Island Light. There's plenty of room to walk the miles of pristine crescent beaches, and at low tide. You can actually walk out to Fox Island, adjacent to the village area, climb up the rock hill and enjoy some breathtaking views. You'll see Sequin Island Lighthouse from there and Pond Island Light as well. Nearby you can also explore Fort Popham and Fort Baldwin. When you climb the tower at Fort Baldwin, you can get a full view of the area. 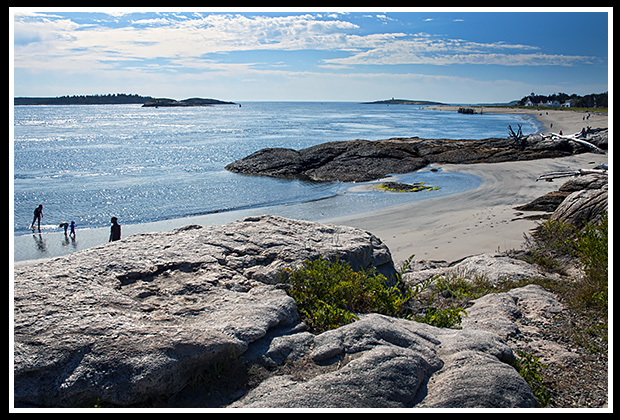 There are tour boats you can take out of Popham Beach to cruise around the islands. The Maine Maritime Museum along Route 209 in Bath (243 Washington St.) offers educational programs, lighthouse and nature tours, with plenty of maritime artifacts that go back almost 400 years to explore. Boat tours out of Boothbay Harbor pass by the lighthouse. Reid State Park in Georgetown, is a family beach and used by naturalists especially for birding. From US Route 1 in Bath follow Route 209 South all the way past Popham State Park to the end to the village of Popham Beach. There you can take a short walk to the beach especially during low tide where you'll find a clear view Pond Island. Boat tours offer many types of cruises. While some may offer specific lighthouse cruises that pass by Pond Island Lighthouse, some will pass by the lighthouse on special charters, narrated wildlife and historic tours, whale watching adventures, fishing tours, and other types of excursions. Weather is also a major factor in New England, especially on sailing excursions.